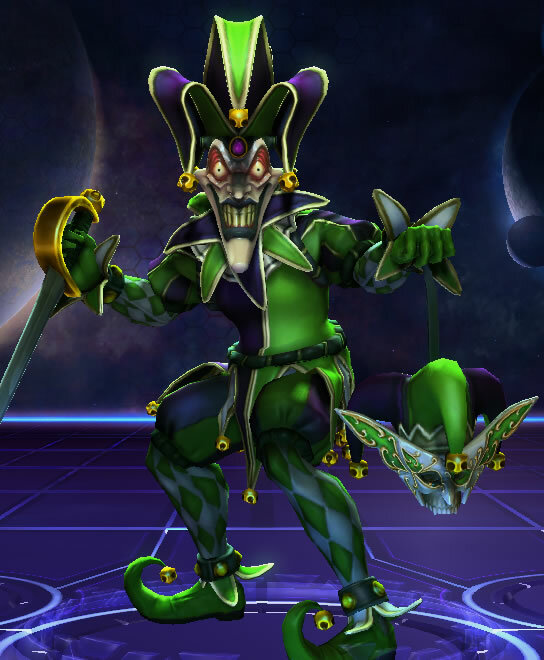 Like most heroes from the Diablo series, the Heretic Witch Doctor Nazeebo is yet another very fun character to play as in HotS. 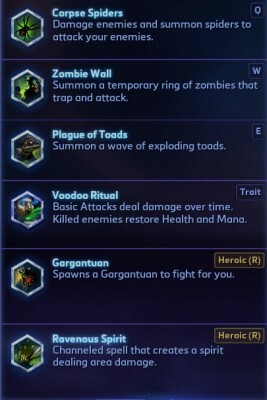 Zombies, spiders, toads, and other nefarious summons are his trademark and if you want to curse your enemies (outside the chat, of course), Nazeebo could be a great hero to purchase in Heroes of the Storm. Below we’ll take a look at Nazeebo’s spells giving you a breakdown of how this hero plays out, and of course we’ll go into detail about which talents you should be leveling up. Disclaimer: the recommended talents are based on my personal preferences and play style, and are by no means the only way to play everyone’s favorite witch doctor. It’s intended for newer players looking for a quick guide, and once you start grasping Nazeebo’s basics you should experiment and see what works for you! Choice of talents may also depend on map or team composition. Trait: Voodoo Ritual – Basic attacks deal damage over time, and enemies afflicted by Voodoo Ritual will restore Health and Mana if slain. Q: Corpse Spiders – Area of effect spell dealing damage upon impact and summoning spiders which attack enemies. W: Zombie Wall – Conjures a ring of zombies which trap enemies caught within it and deal damage to them. E: Plague of Toads – Cone-shaped AoE spell summoning several “toads” that deal damage to first enemy hit. R: Gargantuan – Spawns a Gargantuan who deals damage upon impact and continues attacking for 30 seconds. Deals extra damage to structures. R: Ravenous Spirit – Channeled spell which creates a spirit dealing area damage. Below we’ll take a look at all Nazeebo’s talents and give you a guide on which ones are best to choose. Blood Ritual – Voodoo Ritual (Trait) returns more Health and Mana. Death Ritual – Minion kills give permanent health and mana bonus. Demolitionist – Basic attacks against structures destroy ammo and deal extra damage. Bribe – Active spell allowing you to instantly “bribe” mercenaries to fight for you. In most cases I pick Demolitionist: it allows you to do what Nazeebo is good at doing even quicker: take down turrets and keeps. Since turrets will also attack your zombies (W) you can quick expend their ammo. Bribe is also a choice I frequently go with. Though not nearly as popular among players, I’ve found it very useful on certain maps with important team objectives, such as Haunted Mines or Garden of Terror. Quickly grabbing a Siege mercenary camp right before these map objectives spawn can cause a ton of pressure to the opposing team, and usually at least one player will have to deal with it therefore not joining a teamfight in time. Spider Cluster – Corpse Spiders (Q) creates even more spiders. Gathering Power – Passive spell giving you increased Ability Power. Envenom – Active spell dealing damage over time to a single enemy hero. Promote – Gives increased health and damage to a friendly minion. Envenom is my favorite level 4 talent. Nazeebo is capable of quickly controlling and bringing down his enemies, but very often I lack a bit of damage to finish off opponents so Envenom helps a lot to bring their health down. Promote is a viable option as well, giving you even more tools to push down structures as fast as possible. It has a short cooldown and even holds 2 charges, and paired with Zombies, Bribe and Gargantuan you can quickly summon and strengthen an entire army to fight at your side. I’ve seen players taking Gathering Power quite often as well, though I typically tend to stay away from it. Gidbinn – Empowers your Basic hero abilities (QWE). Corpse Spiders (Q) and Wall of Zombies (W) lasts 25% longer, and Plague of Toads (E) has an increased explosion area. Fresh Corpses – Your zombies have increased damage. Mercenary Lord – Siege and Bruiser mercenaries near you deal 50% more damage. Calldown: MULE – Summons a mule which repairs structures and replenishes their ammo. Clairvoyance – Active spell giving you vision of targeted area for 10 seconds. Gibinn, Fresh Corpses, and Mercenary Lordare the best choices. The choice very much depends on your playstyle and opposing heroes, so Gidbinn is best if you need extra crowd control duration, Fresh Corpses for slightly more damage, or Mercenary Lord if your voodoo army needs even more potency. Gargantuan is almost a no-brainer here, at least for me. He’s strong, deals plenty of damage to enemies, and most importantly helps you take down structures in record time. 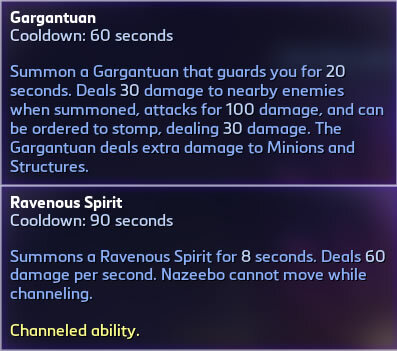 Leaving Nazeebo unchecked while Gargantuan is up usually means you’ll end up with dead turrets and a downed keep in no time. Ravenous Spirit, while fun as an occasional channel-your-inner-troll spell, is just not nearly as versatile or helpful as Gargantuan is. Although I must point out, many players would disagree with me completely on this one, so don’t sweat about it and simply test which ultimate works better for your play style! The damage of course does work on buildings as well so it can fill in Gargantuan’s role as well. Dead Rush – Upon expiring your Zombies will uproot and attack enemies for 3 seconds. Toads of Toughnes – Toads gain damage and size with each hop. Sprint – Active spell giving you a 75% move speed boost for 3 seconds. Ice Block – Place yourself in stasis and become invulnerable for 3 seconds. Dead Rush can be good for extra damage, and can further help to spend enemy tower’s ammo. But, Dr. Nazeebo being as defenseless as he is I often tend to pick up Sprint or Ice Block for more survivability in a pinch, with Ice Block being my most common choice. 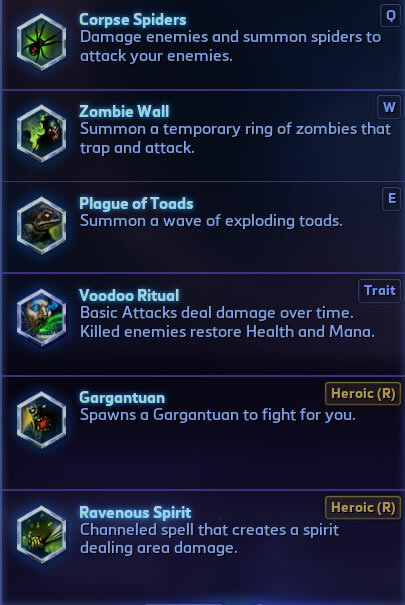 Specialized Toxin – Voodoo Ritual (Trait) deals double damage to enemy Heroes. Leaping Spiders – Corpse Spiders (Q) leap at enemies and do increased damage. Infested Toads – Plague Toads (E) create Corpse Spiders upon exploding. Stoneskin – Active spell giving Nazeebo a 5-second duration shield equaling 30% of his maximum health. Leveling to 16 is not particularly exciting for the Witch Doctor, as the choice of talents is more than often not much of a choice at all. Stoneskin is always good to have, and other talents don’t add nearly as much utility to be considered in majority of games. Humongoid – Gargantuan (R) deals double its previous damage to structures, and lasts until killed. Annihilating Spirit – Increased range and movement speed on Ravenous Spirit (R). Fury of the Storm – Passive ability making your Basic Attack deal extra damage and chain to other targets once every 5 seconds. Bolt of the Storm – Active skill teleporting you to a nearby location. Contrary to level 16 talents, on leveling to 20 does add a bit more variety. Humongoid and Fury of the Storm are both quite fun to have, and when I’m doing quick A.I. games for daily quests choosing between these two is quite difficult. If you took Ravenous Spirit heroic spell, then Annihilating Spirit can really help out with dishing out damage from even further away. However, in normal games nothing beats the usefulness and often the necessity of having Bolt of the Storm. This spell helps you bolt away from danger at a moments notice and is likely to keep you alive more than once during a match. If you can’t push in your own lane, roam to another and go do a quick few hits on the turret or use Zombies to expend tower ammo. Always do your best to keep your passive trait up on dying minions. While it may not seem like it restores a lot of health and mana, it adds up to quite a lot for an entire minion wave. You can also use your trait to help you push minions faster: since it deals damage over 4 seconds, keep attacking different minions to stack the damage on all of them (just make sure to keep in mind the above tip as well). Use Wall of Zombies (W) to expend tower ammo whenever you feel safe enough to use it. Always try to combo your Q and E ability when enemies are caught in Wall of Zombies (W) to make sure they can’t avoid the damage. Nazeebo is one of the most powerful Specialist heroes in the game. For master strategies that will win you over 80% of your matches click here. 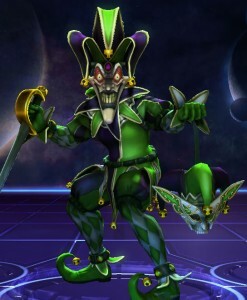 Of all the Specialist characters in Heroes of the Storm, Nazeebo is likely my favorite one. Though dark and mysterious, he’s also quite entertaining and playful and he certainly fits my somewhat trollish style. He’s great at quickly raising an entire army of minions and mercenaries to help him demolish structures, and taking timely advantage of missing or dead enemies is crucial. He’s great at causing chaos when everyone else is focused on something else, and is particularly useful in backdooring the enemy base while they’re off grabbing skulls, seeds, or other map objectives. Do you have your own way of playing Nazeebo? Let everyone know how to make the most out of this hero in the comments below.